Initially I had thoughts of testing the recently tweaked 2-Skewer Sled to see how it would go in stronger wind. 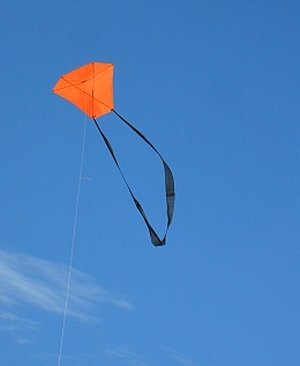 A light-wind kite! On second thoughts, the 2-Skewer Barn Door was put in the car as well. This design was much more suited to fresh wind. And even more so since some extra tail had been added a few weeks ago. At the reserve, the barn door kite was flown on quite a short line to get some video. Being somewhat sheltered from the full force of the breeze, the bright orange craft floated about and even descended to the ground a few times. Once, a gust came through which caught the leading edge as the kite lay there facing the breeze. All of a sudden the small barn door was away again - with no action by me! After this, I walked across to the far side of the reserve where there was a gap in the line of trees. While doing this, line was let out quickly as the kite got it's teeth into the fiercer winds up higher. In no time, the 2-Skewer Barn Door was soaring around on 60 meters (200 feet) of line. Gentle curves in the longest edges of the sail indicated the considerable gust strength up there. In typical barn door fashion, the kite leaned over and traversed far to the left or right when under pressure. Such was the breeze strength that the kite was once forced nearly all the way to the ground, far off to the right. However it was soon soaring high once again. With sunlight starting to bathe the area, patches of rising air began to push the kite almost overhead at times. What a flight! It would appear that with just a modest amount of extra tail, this '3-sticker' design will cope with just as much wind speed as the 2-skewer Box kite. On arriving home, it was discovered that gusts had reached the mid-thirties in kph. That's well into the Fresh range! Or near enough to it, at rather high line angles in a variable late-afternoon breeze. It's a weather feature where we live. Occasionally, when the wind flows over the hills from a particular direction, it can get very gusty and chaotic for many kilometers downwind. Even with no or very little thermal activity to disturb the air. Yesterday was such a day. Although the sun was in a similar direction as the kite, it didn't prove to be a problem for photos or video. The kite was very high and the sun was close to the horizon which worked out OK. It took a little while to get the 2-Skewer Barn Door away since the average wind speed near the ground was quite low. But I persisted, urged on by the sight of waving tree-tops here and there. After a couple of short flights, a little more height was gained. Just enough to move around a clump of trees into a more open section of the reserve. The barn door kite flew for a while on 30 meters (100 feet) of line, but seemed eager to lean to the right much of the time. Then I noticed the tail plastic was all caught up, about half-way down. After fixing that, the kite soared up straight and true. Right up to 60 degrees on 60 meters (200 feet) of 20 pound line. The 58cm (23") span kite seemed far away on that modest length! I backed up some more and let out more line to over 90 meters (300 feet). Strangely, despite the very late time of day, the kite seemed to be in rising air since it pulled firmly and climbed very high. Below the kite, the line dropped almost vertically before curving back to where I stood. By this time the breeze strength had dropped overall, which often happens near sun-set. The kite even descended most of the way down before a little working of the line restored it to it's previous altitude. Sometimes, during lulls, the sail flashed bright and dull orange as it descended slowly with a falling leaf motion. Just when I thought breeze had really died down, it was on again... In all directions, treetops could be seen waving around. So, after a bit of fiddling around, th 2-Skewer Barn Door returned a great flight. The kite looked good with it's bright orange plastic lit by the setting sun. This time it was the 2-Skewer Barn Door. Another venerable Blast from the Past. In anticipation of windy periods outside, I added a few loops of plastic tail to the middle of the existing tail. This turned out to be a good move! Down at the reserve, the bright orange kite quickly took to the air. Not being sure about the wind direction, I had stopped in a spot well away from all the surrounding trees. The air was active, causing the ground-level wind direction to shift around by up to 90 degrees! With more height however, it was clear that the prevailing direction was more or less from the north. On perhaps 20 meters (60 feet) of 20 pound Dacron line, a few short videos were taken. The Barn Door moved about a lot, against the smooth and almost featureless overcast sky. The air was warm, around 33 degrees C.
Moving to a suitable location near one edge of the grassed area, I let out line. Since the line was on a simple block winder, I just let it slip through my hands. The 2-Skewer Barn Door rose steadily over the reserve, maintaining a 45 degree line angle while the block winder danced and tumbled furiously on the ground. I stopped briefly at a line length of 60 meters (200 feet) to observe the kite for a while. Nah .. let's go higher! So out went another 30 meters of line until the 90 meter (300 feet) marker came off the winder. Anyway, on the long length of line the kite found itself under pressure from freshening winds. An early check showed 8kph gusting to 16 kph. But this later increased to an average of 9 kph with gusts to 21 kph. Light, but gusting right up into Moderate, in other words. The Barn Door started to fly high but then performed a very wide loop to the left, to within a few meters of the ground. After recovering, the kite worked it's way up high again before traversing far over to the right. This prompted me to take in plenty of line to avoid tree tops! Bike-riding for the younger one, while the (much) older one flew a small bright-orange Barndoor kite over a grassy knoll. Yes, an actual knoll in the lush green field, although I suspect this one was originally created by a bull-dozer! Aren had fun riding down the steep side, carving prominent tracks into the clover and grass. Just before launching the kite, the wind meter was showing a 5 kph average with a gust to 10.8 kph. Perfect for just about any 2-Skewer kite of mine. The small Barndoor twisted and turnd in the rough air down low before rising up easily into smoother air. On about 60 meters (200 feet) of line, the kite performed for the camera, the Winter sun flashing off the brightly lit plastic sail. Later, with the line out to 120 meters (400 feet), some sag started to develop due to the length. Occasionally though, gusts would pull hard at the kite, taking most of the sag out. Just for a few seconds at a time. A bird flew past, just missing the line, quite close to the anchor point. 20 pound line is sometimes hard to see - even for the birds! Since the breeze up high was now pushing the small kite hard, a few adjustments to the bridle were necessary. Several times, I brought the kite all the way down to tweak the Prusik knot across one way or the other. It seems that any kite with spars on a diagonal responds very precisely to sideways movement of the towing point. The final flight today went high and straight. However, with enough wind speed, you can get to a point where the kite will be forced into instability. It will start to loop in an unpredictable direction, despite being perfectly trimmed. For a while it was a pleasure seeing the kite coping well on a long line. Exploring the sky at the upper end of its wind speed envelope. Finally, my son Aren pulled in the line while I wound it onto the wooden winder, to avoid excessive tension. With the sun out, Winter flying can be pleasant enough! New 2-Skewer Barn Door Has A Wild Ride! The 2-Skewer Barn Door has recently been re-made, mainly to improve the How To instructions and bring them up to date. I did take the opportunity to re-design the bridle though, making it about half as long as the original. Together with increasing the amount of dihedral, these changes had a great test today in gusty moderate winds. The aim was to extend the upper limit of the wind range for this kite! A few photos were snapped off while the Barn Door was on a fairly short line. As often happens, the very first image was the best. Took quite a few as the kite darted about in the swirling gusts near the ground. At least there was bright sunshine from time to time as the clouds swept by overhead. With 30 meters (100 feet) of line out, all was well, with no consistent turning in one direction or the other. However, like many of my small Barn Doors, this kite seems to like taking long excursions across the sky from one side to the other! Just from time to time. While flying on 60 meters (200 feet) of line, the kite was gripped by a strong patch of rising air. So, I shook line off the winder while the bright orange kite rapidly got smaller - almost straight up! In a matter of seconds, the 90 meter (300 feet) flag was out and I decided to stop the climb there. The wind meter, sitting near the ground, recorded just over 7kph, gusting to 17.5kph. Higher up, it would have been more like 15 to 25kph for much of the time. Wind readings in the metro area were all over the place. At the intended flying spot, or close to it, the weather site was saying 7 - 9kph. OK, pretty light. Just a few km further north, at Adelaide airport, the figures were 24kph gusting to 39kph! So, I grabbed the little 2-Skewer Barn Door kite. Good in light winds but also strong enough to hold together in the rough stuff. The kite lapped up the gusty gentle-to-moderate breeze, pulling firmly and making it's way all around the sky. As Barn Doors do, the kite traversed far off to left and right when near it's wind speed limit. Rising air sent the kite soaring to near-90 degree angles, more than once. What goes up must come down however, so at another time the kite hung low over a large downwind tree - pulling hard but going nowhere in the descending air! Eventually, line angles returned to normal. It was a short but pleasant outing, seeing the dusted-off kite do it's thing at over 200 feet off the grass. 20-pound line stretched tight. The sail back-lit by brilliant sunshine. A local kite business put on a public event yesterday titled 'Kites, Bikes and Picnics'. Kites were indeed there in abundance, most having been purchased from a display beside the grassy field. The field being the Henley Grange Memorial Oval here in Adelaide, South Australia. Aren and I turned up for a fairly short visit since we needed to be home again by a certain time. Never the less, it was enjoyable seeing a dozen or so small kids and parents having reasonable success with their kites. As we wandered about taking photos and video, numbers swelled with more families walking or driving in. Aren got enthused and asked to go back to the car to grab a kite. So, out we came with the 2-Skewer Barn Door, which proceeded to float into the air without much trouble. The six-sided bright orange kite ended up flying at around 100 feet for much of the time. Winds, however, were quite variable. Occasionally the breeze would really die off, sending all the kites to the grass. Three AKFA members, including myself, were present although I had brought no large kites on this occasion. A fairly large single-line parafoil was up there though, trailing long twin tails and making a statement... 'Single-line kites aren't just for kids - check this out!'. The weather site was indicating winds over 10kph so the 2-Skewer Barn Door kite seemed a perfect choice. 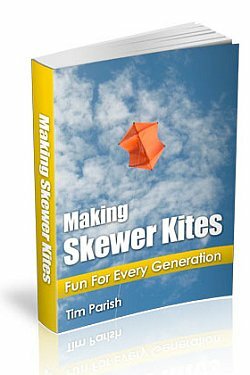 Even in a much lighter breeze, the light-weight skewer-and-plastic construction would ensure that the bright-orange kite would fly. Well, it did, but only just! Walking towards the middle of the reserve with the small Barn Door, loop after loop of flying line came off the winder as it tumbled around in the grass. Untidy but it works. With about 30 m (100 feet) of line out, I walked briskly back to the winder, running the line through my hand. With a little bit of grip applied, the kite rose up willingly enough. Only to lose height immediately, wafting face-down towards the ground. For the next 20 minutes or so, it was one of those ultra-light-wind skill-building sessions. Tow up, pull in, let out, pull in again, let out during another tantalizing gust and so on. The idea being to keep the kite in the air as long as possible. Finally, after several pull-launches off the grass on a long line, the kite found some faster air above 200 feet. That's more like it! Now it was possible to just stand back and enjoy the sight and feel of the kite in adequate air pressure. Soon, the orange Barn Door kite was cruising about at steep line angles, staying around 300 feet above the reserve. A lot of motorists on South Road would have noticed it too. Nice flight, after a somewhat slow start!